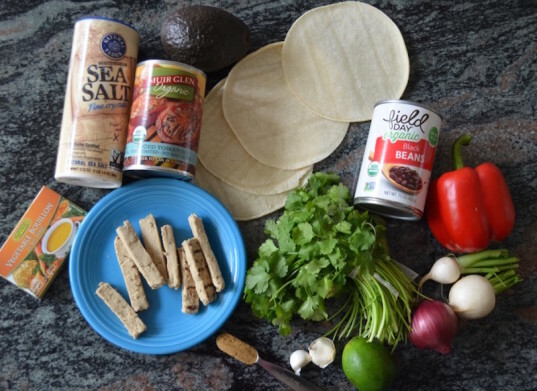 We're posting this recipe especially for Cinco de Mayo, but we know you're going to come back to this quick and easy vegan tortilla soup all year round. 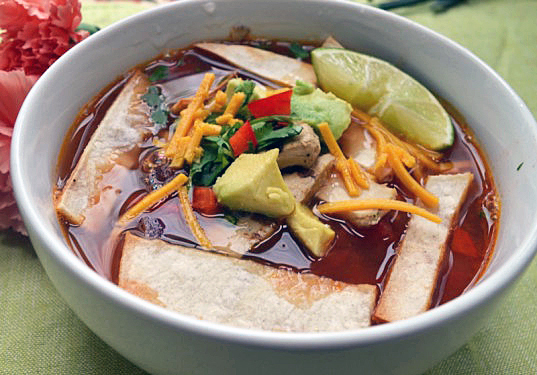 There's just something about the tasty combo of veggies, the flavorful broth, the variety of possible toppings, and, of course, the crunchy homemade tortilla strips that make this soup a favorite in every season. Plus, kids will love choosing their own toppings. 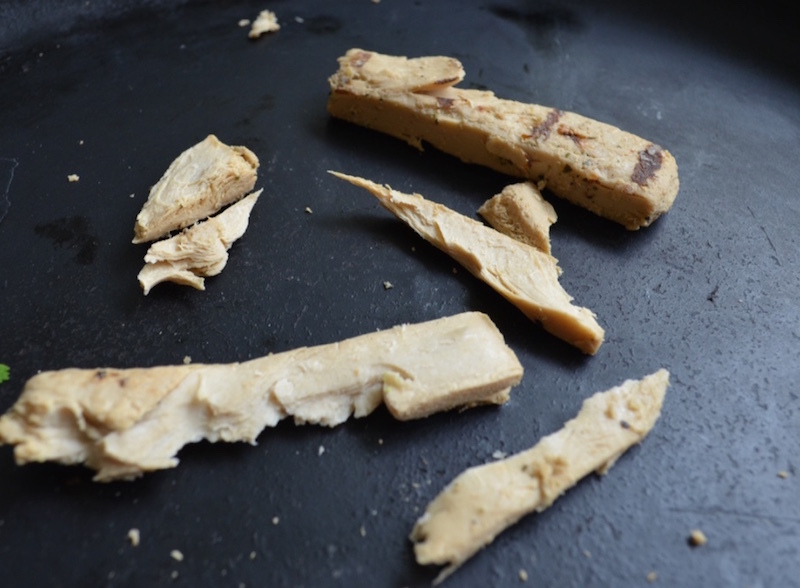 My kids loaded theirs up with avocado, vegan cheese, and tortilla strips. 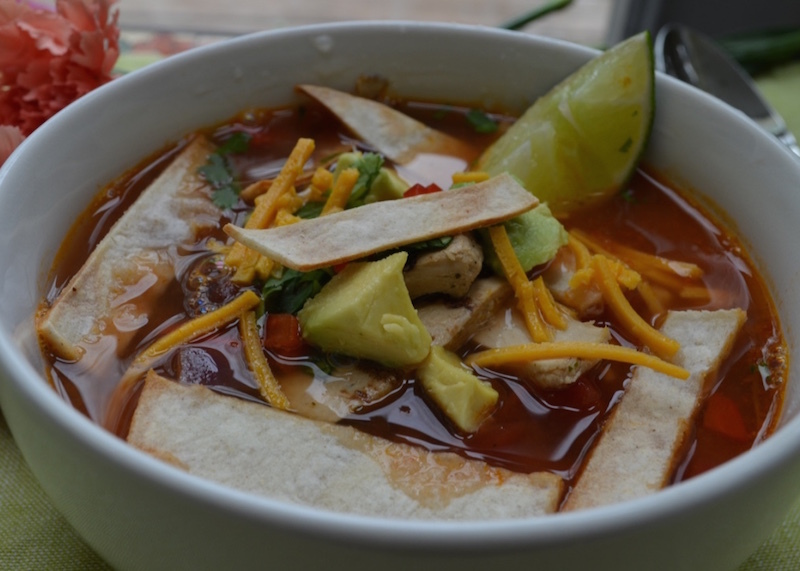 Tortilla soup is often made with chicken, but this vegan and gluten-free version is just as yummy; we've included an option for faux chicken if you'd like to add even more texture and flavor. Serve with some addictive and delicious vegan mango bars and you'll have some happy niños felices (that's "happy kids"). 2. Chop and mince the vegetables. Dice the onion and pepper-I only used about 1/2 the pepper since my kids aren’t huge red pepper fans, but feel free to chop up the whole thing. I like to save a few pieces of diced red pepper to add on top of the soup at the end. Mince the garlic. 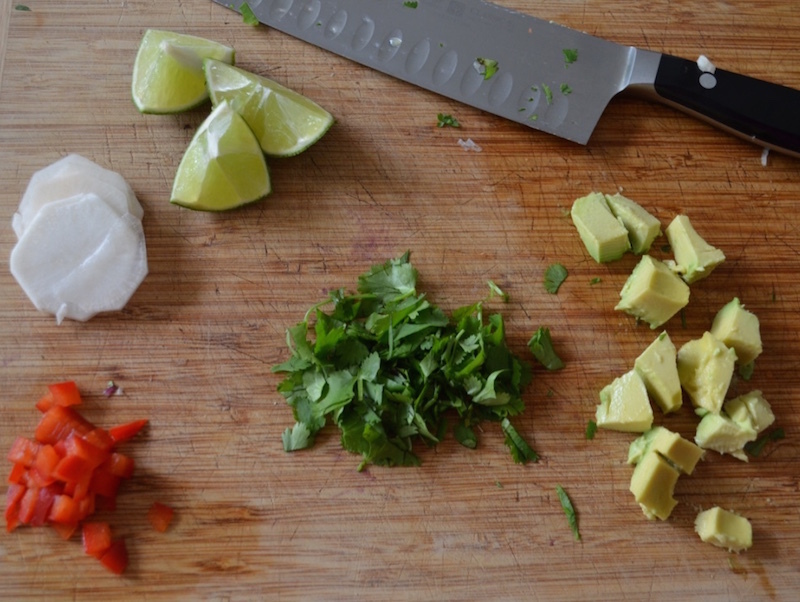 Wait until the soup is cooking before you chop the other ingredients (especially the avocado) so that they don’t oxidize and turn brown. Preheat the oven to 450 degrees F (this is for the tortilla strips). In a soup pot, warm the olive oil over medium heat. Add the onion and sauté for 2 minutes to soften slightly. Next add the diced pepper, minced garlic, and cumin powder. Sauté for about 3 minutes. 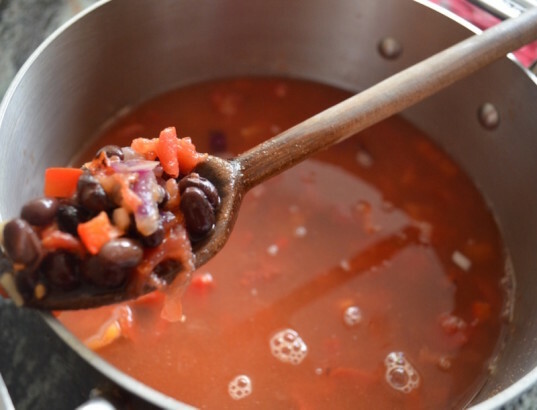 Drain and rinse the black beans and then add them to the soup pot. Add the can of tomatoes and the vegetable broth or the equivalent amount of bouillon plus water. Stir then add the salt. Bring the soup to a boil and then reduce the heat to a simmer, covering partially. Let the soup simmer about 7-9 minutes to let the flavors blend. 5. 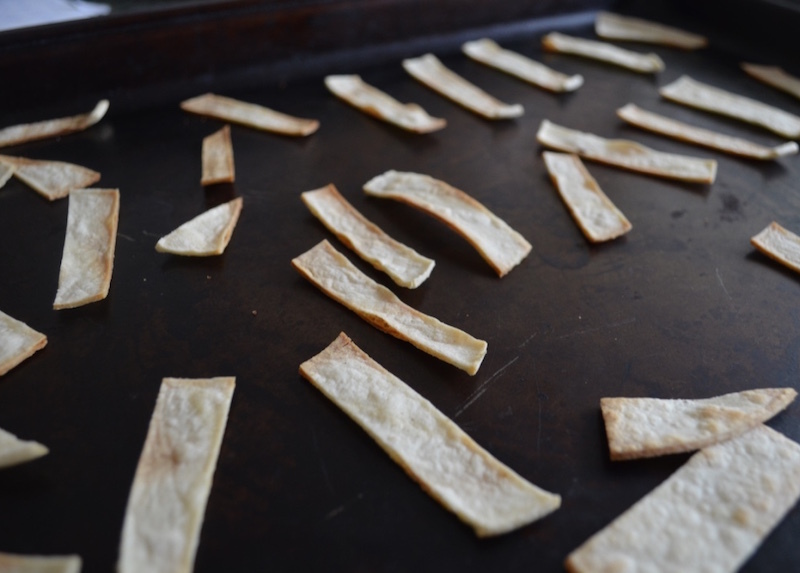 Make the tortilla strips. Cut the corn tortillas into small strips. Place the strips on a baking sheet and bake in the preheated oven about 6-7 minutes until the strips are golden brown. Remove from the oven and let cool. While the soup is simmering and the tortilla strips are baking, make the toppings. Cut the avocado flesh into small pieces or wedges, make thin slices of radish, cut the lime into desired wedges, and chop the cilantro. You can add the faux chicken strips (if using) to the soup during the last few minutes of cooking. I prefer to tear or shred the chicken, which is how chicken is often prepared in traditional tortilla soup, and then give it a little crispiness by cooking it in a non-stick pan over medium heat for about 3 minutes on each side. 8. Serve the soup, top, and enjoy. Taste the soup and add seasoning as desired. 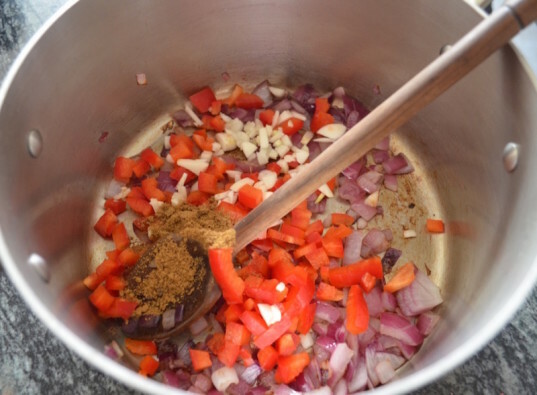 Spoon into four bowls and then top with whatever veggie or herbs you would like and a squeeze of lime. Serve immediately and enjoy. 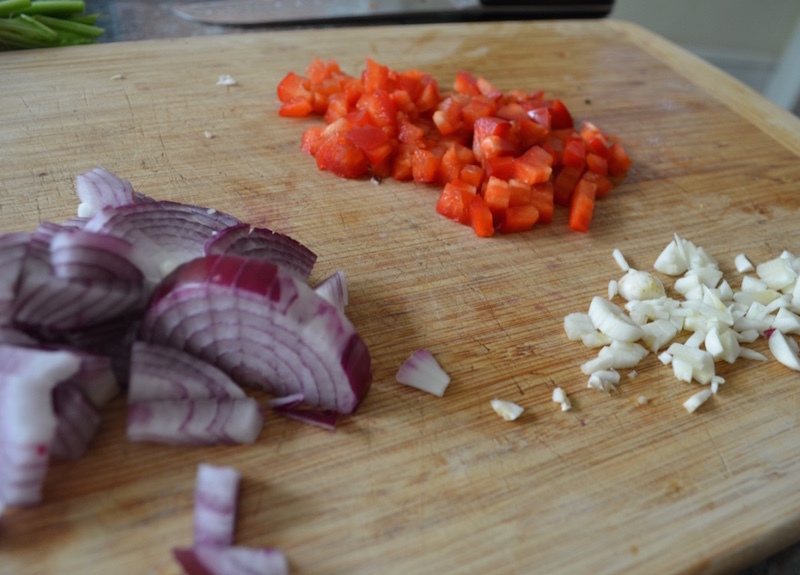 Dice the onion and pepper-I only used about 1/2 the pepper since my kids aren't huge red pepper fans, but feel free to chop up the whole thing. I like to save a few pieces of diced red pepper to add on top of the soup at the end. Mince the garlic. Wait until the soup is cooking before you chop the other ingredients (especially the avocado) so that they don't oxidize and turn brown. 7. Cook the faux "chicken."